up part of the Bonsai Mountain. That said our current lodgers Mr Bo Jangles and Rosie had full time fun. So the day wasnt my best but ended well with a nice surprise bloom of daffodils which in the morning had just been buds. For the second year in a row I have remembered to plant all the bulbs I have bought/been given so we should have a decent show this year. Readers might spot that I have managed to break another camera, hence the left side being so blurry, new one is on the way. This is the view of our backyard yesterday evening with a full moon rising. Things like this make you realise how lucky you are despite the stupidity of others. 4 am Saturday morning is never a good time particularly when you have been marooned upstairs with a bottle of gin waiting for the varnish to dry on the living room floor. Despite what it said on the tin the varnish had not cured enough for its final coat so I retreated back upstairs with my deserved headache and waited. By 8 am it was safe to walk across and after all the critters had been seen to and secured away from any wet floorspace I set about the boards with a brush and applied the last of 3 coats. Thankfully it only took 59 minutes and I was off to engage in a real nerd activity of playing with little men. This is more wholesome than it first sounds, a wargame at Red Kite HQ using hundreds of painted miniature figures (for once not mine) and so a famous battle of the American War of Independence was about to re-enacted. However this would have to wait as a small matter of a 10km time trial had to be completed in less than ideal conditions and with legs abd back that were suffering from 3.5 days of roofing and flooring. Time trial over 19.21 not too shabby considering the wind I headed off to Agnesed where a diminutive Scottish lady beats me up under the guise of Osteopathy, a service I cannot do without. Thus cured of all movement induced pain it was back to Red Kite to assume command of the colonial army. Who got hammered by the British, here is my last stand in the cornfields surrounding Freemans Farm. In actual fact the table game mirrored the historical event, the colonials got stuffed by the well disciplined Brits, but inflicted heavy casualties on the Kings men which meant the following day at the second battle of Freemans Farm the plucky Brits lost against a larger American foe. Ah well, the rest as they say is history. Nerd attack over yours truly got to take his beautiful and oh so patient out for a curry. Now it may have escaped your attention but in all the chaos of the last three point five days several very important people have been absent. This due to the fact that small children and large floor sanders don't make for good company. So they all departed to live with Supergrandma for the week leaving me to eat cup a soups and cereals stood in the kitchen by himself. So the chance to sit down and eat while spending time with the love of my life was jumped at. Late afternoon the boys were back in town and all work stopped for much needed cuddles and rocket launcher practice. hence the need to upgrade the roof. The onduline roof which ia made from compressed tea bags and about as water resistant gave up any pretence of weather resistance so this nice new metal one will be much better. Apparently. After a long chat with a Canadian hiker and a meeting at the Red Kite office it was time to finish the floor before it finished me. which explains the blurry double vision. With large amounts of the floorboards reduced to dust, and it being the first non windy sunny day since I bought a roof for the stables, yours truly left the dusty interior of the cottage for the lofty heights of the equines home. Here we can see Rocky looking for me, I'm on the Wrooof! the clear blue skies making the torment of close encounters with spiders and the ever present danger of gravity just about bearable. Thankfully some of the time I was stood on something more substantial than a ropey ladder. Rocky also tried to join me at this point. almost complete, two more sections to go. The fact that I've only got one section left is a mere technicality. Which was one of the things I thought about on tonight's 10k. For various reasons yours truly suffered a severe bout of insomnia last night, or to be more accurate, this morning, and having watched the clock from 00.35am to 2.15am with no indication whatsoever that the Sandman would come I decided on using the two hours more productively. Which is why I could be found out on the ridge wearing my anti zombie socks and jacket, carrying pepper spray to deal with werewolves or trolls that got too inquisitive, posing by the Whetstone, who, unlike legend has it, had not wandered off into town for a drink, but remained steadfast and rock like where its always been. The one horse town's horse was sensibly tucked away in his bed while I completed my trek to Red Kite Fostering's offices (avoiding the graveyard route I normally take) to collect my bike. I quick change from mountain gear to mountain bike apparel and I was off, heading back to Rock HQ where I managed to get 45 mins horizontal time before the main tasks of the day. Unlike other people who take time off in the half term to take their kiddies to zoos (and hopefully bring them back) yours truly was tasked to return the oak floor of the cottage back to its former glory. The glory before 10 years of mountain dogs, mountain boots, ponies, goats, two small children and all sorts of food, crayons, chalk, bike oil and dog wee had tarnished. Instead of being a nice light oak colour it was now a horrid brown. Queue Mk1 Noisemachine designed to turn nasty grubby floors into shining new ones by taking several layers of wood off. As many of our floor boards were various stages of uneven this Noisemachine was sorely tested. As were the supply of 100 sand paper belts that it came with, many of which just disintegrated seconds after the five minutes spent fitting. Despite such bothersome setbacks within hours several pounds of dust had been extracted from the floor and evenly distributed across the rest of the cottage. Prudent use of dust sheets saved many areas but the kitchen copped the fall out as did all my beautiful and oh so patient wife's clean washing. So whilst progress has definatgely been made yours truly has hios work cut out to get the job done by tomorrow, as well as all the washing. But at least the floors clean. For now. In places. with members of our clan. No time to fill you in on the exciting adventures of January, most of which were very wet and almost all of which involved mud. So if all is well, from tomorrow the blog will be back to normal. So let the chaos commence. This rather boring picture of my dinner might actually represent a breakthrough in so far as this blog is concerned. It might herald the fix of the tech failure that has prevented any regular postings. Watch this space for further progress. The pic also records what I have given up for Lent, meat, yes yours truly has gone veggie for the next 40 days and nights. So far so good. 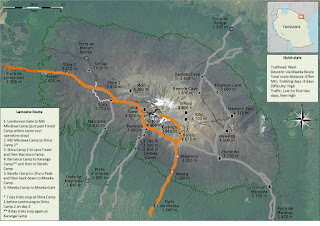 Meanwhile a lot of attention is being paid to this map and the Lemoshi route which yours truly will be plodding along next January, all being well. They might be of small stature but they have big appetites so the shitlands, Trevor and Misty got turned out onto the top fields today which are lush in pasture compared to the desolate wasteland they have turned Oak Bank and Willow rise into over the last two weeks. Here we see the little shitland Trevor having a munch. Mind you an alternative name will have to be thunk foe Willow Rise as the willo no longer rises, more lies in the mud in bits. Here the Rockstar explores the debris. who is aged 11 weeks and looks like he might grow into those paws really quickly.